Note: For file transfers, consider using item 202 0196. 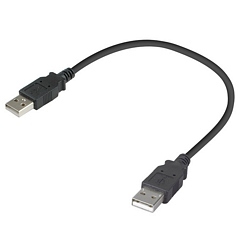 A USB Shortys® cable provides easy access to hard-to-reach USB ports on your laptop or USB hub. Or they can help navigate around other plugs and devices that are blocking USB ports. Use a USB Shortys® cable to replace the unnecessarily long peripheral cable that came with your hub, printer, scanner, or digital camera. Please note that this cable is not a peer-to-peer data transfer cable. Attempting to connect two computers with this cable would most likely cause a short circuit.